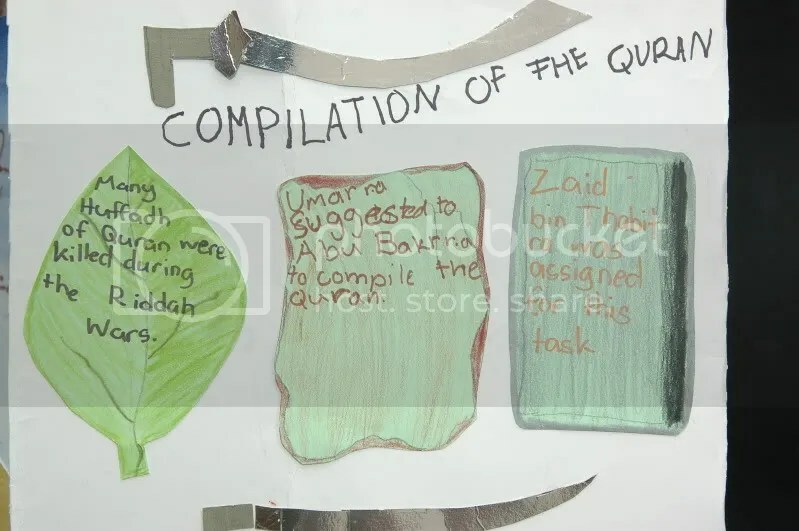 Lapbook : Abu Bakr As Siddiq r.a.
We made a lapbook on one of the greatest sahabahs : Sayidinna Abu Bakr As Siddiq. Z, my little one sponged the blue sky of the cover and wrote (or rather copied) the title. 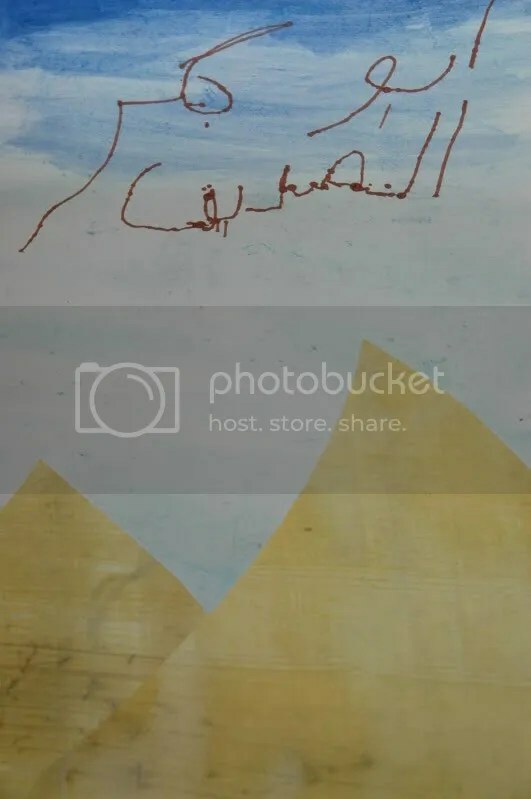 Bless him when he had trouble writing As Siddiq and the feltpen smudged the cover. 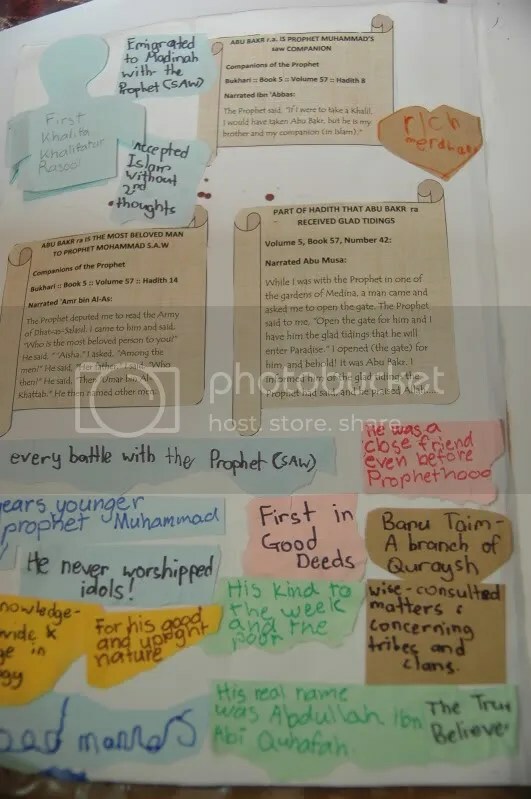 We described who Abu Bakr AsSiddiq was and made little notes and pasted it on the lapbook. Among them are : The first man to embrace Islam, made hijrah with rasullulah saw, the first khalifah and so on. Really fun activity because we were brainstorming what we know about him. 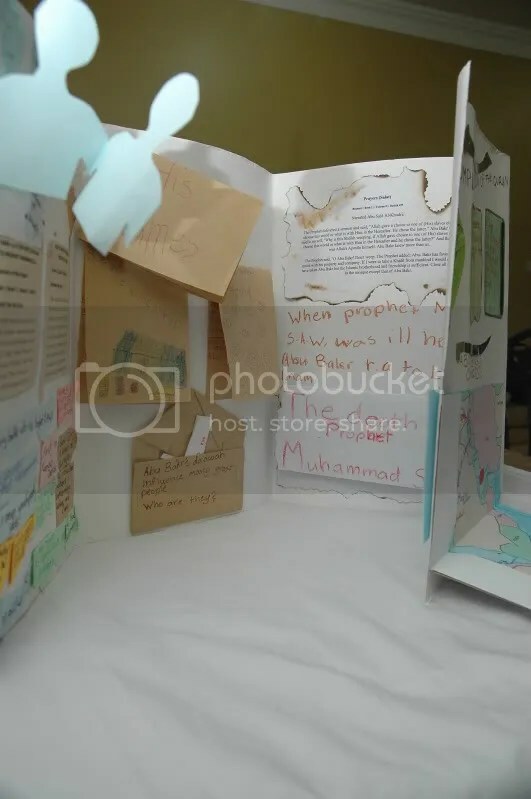 I put up a few hadith on what Rasulullah saw said concerning Abu Bakr As Siddiq r.a..
We made small booklets of his many nicknames. 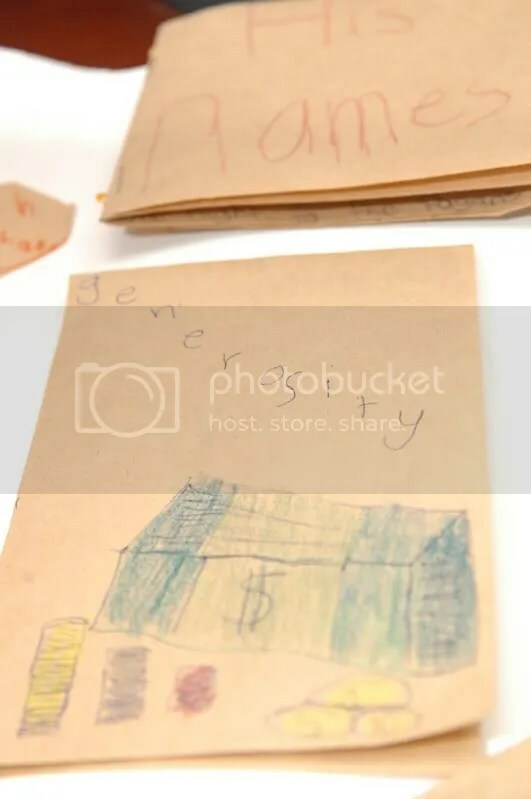 And a flip chart narrating Abu Bakrs r.a. generosity and also another flip chart describing that he was so generous, he was always freeing the Muslim slaves. Most of them are old and frail and also woman slaves. This seemed strange those days for people would prefer to free strong slaves. These slaves can help the person later. So what use would an old ex slave or a woman slave be to one? But Sayidinna Abu Bakr r.a. were only doing that to please Allah. May we have the same sincerity. Do you know that some part of Surah Al Layl was about Sayidinna Abu Bakr. Refer to Al Layl 92:5-7, 18-21. May we be able to emulate his virtues. 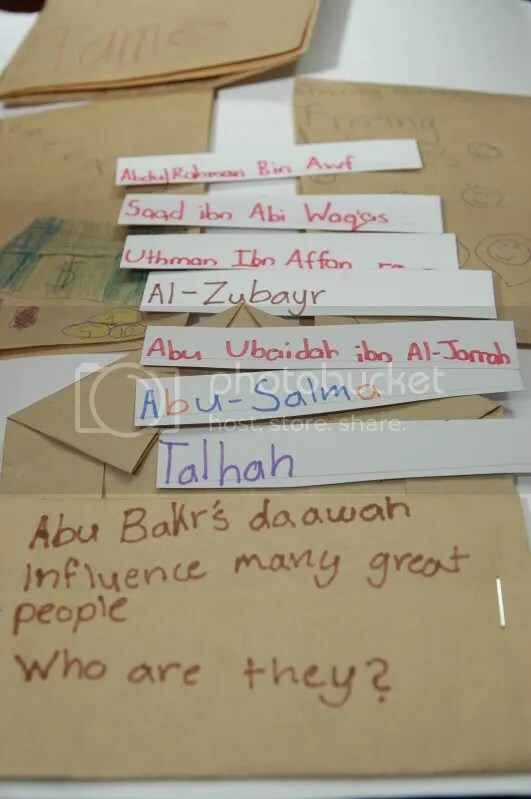 We also listed down some of the “big” names that Abu Bakr made daawah to. Some of them are Uthman bin Affan r.a., Talhah and Abdul Rahman bin Awf. Masya Allah! Then we read the story of when our beloved Prophet s.a.w. was ill and nearing his death. Abu Bakr was asked to lead the other Muslims in the congregation prayer. I also included the small portion of rasulullah s.a.w last sermon when he said, “Allah gave a choice to one of His slaves either to choose this world or what is with Him in the Hereafter. He chose the later.” And how Sayidinna Abu Bakr r.a. cried listening to this because he knew what Rasulullah meant by that. This indicates their close relationship and his deep love to the Prophet s.a.w.. 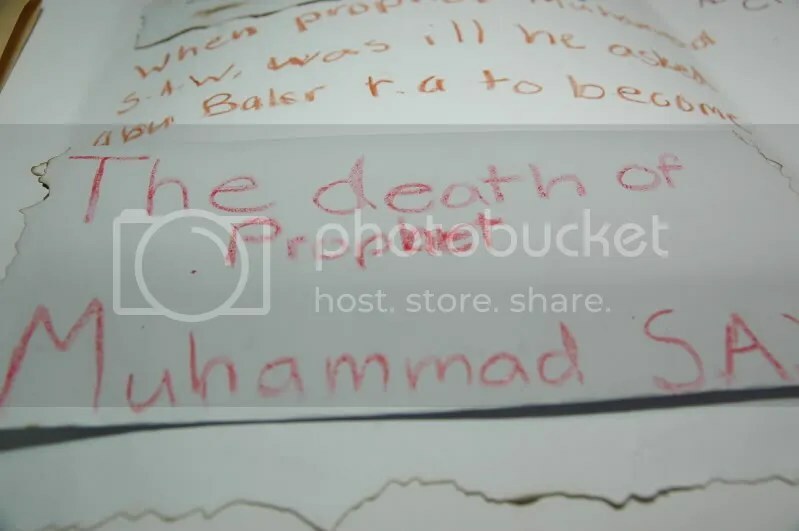 I asked H to write down a bit of Abu Bakr’s words when people could not accept the death of Rasulullah s.a.w. I emphasised to them. Rasulullah s.a.w is Abu Bakr’s closest friend. Of all the people, surely he would have been the most distraught. But he was the one who calmed everyone down. 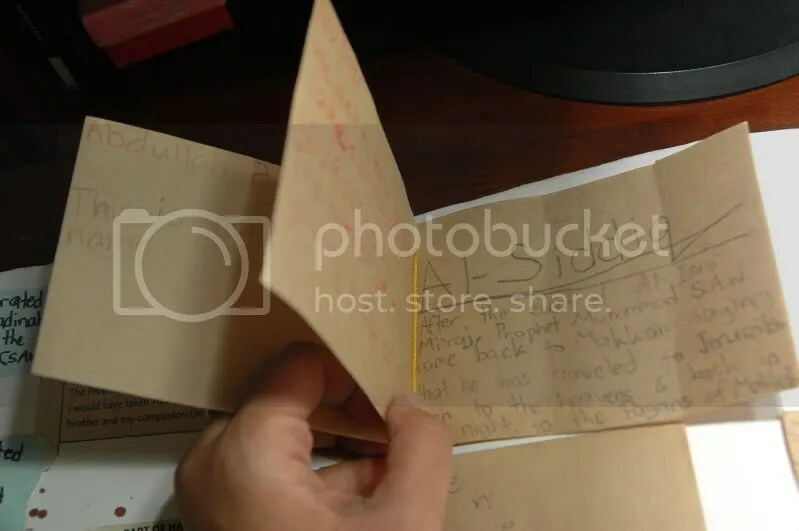 We included in brief, the challenges Abu Bakr AsSiddiq faced when he first became Khalifah. We cut up a mean looking sword at that. 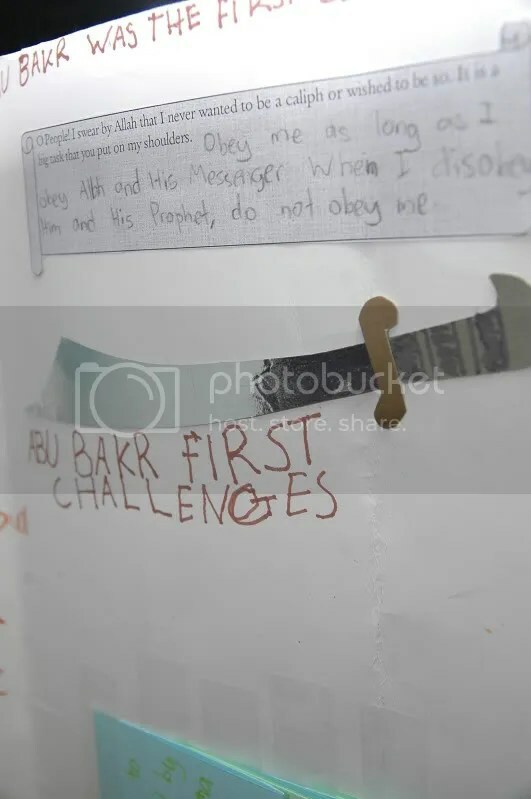 😀 And we made some working files of Abu Bakr’s first few challenges. 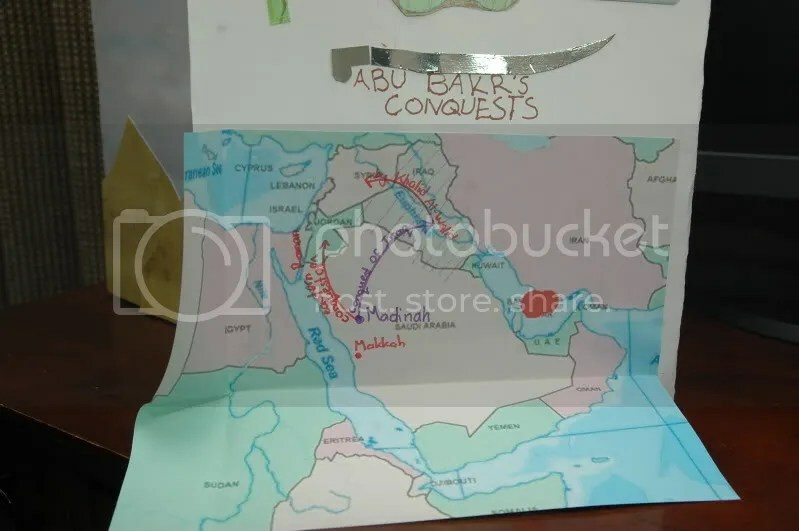 And finally I put up a map to show the countries that was conquered under the reign of Khalifah Abu Bakr r.a. Subhanallah! May my children learn to love the sahabahs. And the fact that they fought to instill haq back 1400 years ago, and with Allah’s will, light still exist in this world now. Alhamdulillah. May we be guided on the straight path always. May we be able to emulate their virtues and have faith as strong as the sahabahs radiallahuanhum. 2. Shining Stars Among the Prophet’s Companions Vol. 1 – Abdul Basit Ahmad. 3. 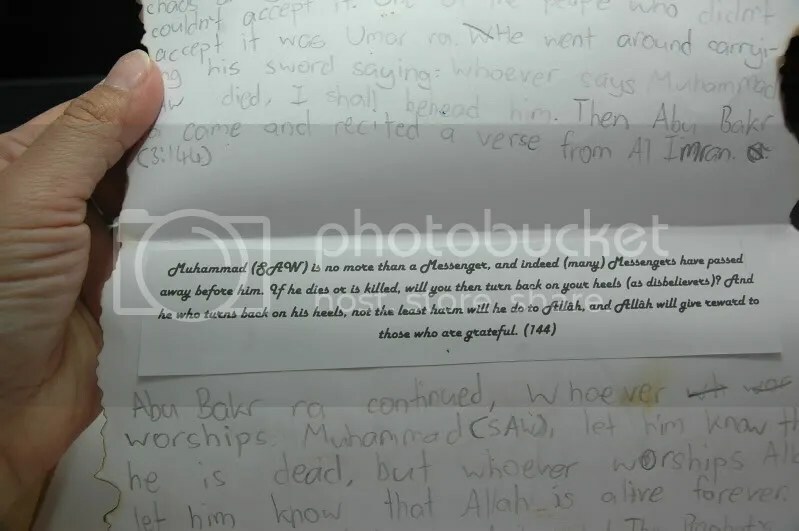 Lecture by Sheikh Anwar Al Awlaki – Abu Bakr As Siddiq His Life and Times. You can listen it HERE. For now we will concentrate on the pillars of prayers. If one of them is omitted, the prayer will not be accepted. The Prophet (peace_be_upon_him) said: The key of prayer is purification. The act that puts on into the inviolable state (of prayer) is the takbeer. And the act that ends the violable state is the tasleem (salutation). This hadith is hasan saheeh. According to Sheikh al-Albani, Saheeh Ibn Majah. recorded by Tirmidhi, Abu dawood and Ibn Majah. Takbir Al Ihram is a pillar of prayer meaning if we leave it, our prayers is not accepted. I was taught when I was young to say the niyah of prayer in my language in the heart while reciting the takbir. Thus my takbeer became very loooonnngg and sometimes jerky. This is unnecessary fr it is not in the sunnah to say the niyah in the heart during the takbir. Rather the niyah must be thought in the heart before the prayer itself. Raising your hands during takbeer is sunnah or recommended acts. Meaning if one leaves it, the prayer is still valid. However we would have missed on doing the sunnah. I saw the Messenger of Allah (may peace be upon him) raising his hands opposite the shoulders at the time of beginning the prayer and before bowing down and after coming back to the position after bowing. but he did not raise them between two prostrations. the Messenger of Allah (may peace be upon him), when he stood up for prayer, used to raise his hands apposite the shoulders and then recited takbir (Allah-o-Akbar), and when he was about to bow he again did like it and when he raised himself from the ruku’ (bowing posture) he again did like it, but he did not do it at the time of raising his head from prostration. This hadith has been transmitted with the same chain of transmitters by al. Zuhri as narrated by Ibn Juraij (who) said. When the Messenger of Allah (may peace be upon him) stood up for prayer, he raised hands (to the height) apposite the shoulders and then recited takbir. The Messenger of Allah (may peace be upon him) raised his hands opposite his ears at the time of reciting the takbir (i. e. at the time of beginning the prayer) and then again raised his hands apposite the ears at the time of bowing and when he lifted his head after bowing he said: Allah listened to him who praised Him, and did like it (raised his hands up to the ears). that he saw the Apostle of Allah (may peace be upon him) doing like this (i. e. raising his hands) till they were opposite the lobes of ears. All of these hadith above are sahih. 1. We can raise our hand during takbir al-ihram either at the lobe of our ears or at our shoulders, Insya Allah. 2. This also apply to the takbirs before ruku’ and after ruku’. These after ruku’. Boy at ears. Girls at shoulders? I was also taught when I was young that for boys to raise their hands at the ears while the girls at the shoulders uring takbeer. From these ahadeeth, it is clear that one can raise their hands either at the shoulder or the ears regardless of gender. There is no difference between a man’s prayer and a woman’s. We pray as how Rasulullah saw prayed. 1. Takbirratul Ihram is a pillar of prayer. 2. It signifies the starting of a prayer. 3. If we miss it, our prayer is not accepted. 4. Raising the handsduring takbiratul ihram is sunnah. 5. Thus if we do not raise the hands during takbiratul ihram, or prayer is still accepted. But we would have missed the reward for sunnah acts. 6. We can either raise our hands to the level of our shoulders or to our ears. Rasulullah saw did it both ways. 1. Ahmad raised his hands at his shoulders during takbirratul ihram? Is his prayer valid? 2. Ali did not raise his hands at all during takbir. Is this ok? 3. Aminah did not say her takbir when she starts prayer. Is her prayer valid? This is just to train the little Z since he got excited about the dua’ after wudhu last week. A Muslim declares the shahadah. Shahadah is the first pillar of Islam. Saying the shahadah and believing it makes you a Muslim. Do you know that if someone who is not a Muslim and wants to become a Muslim, all he needs to do is first of all say the shahadah and believe it? What are you suppose to believe? It means that I declare that there is only one God. He does not have any partner. He does not have son. I declare that Allah is the only god to be worshipped. There is no other God for me. I declare that Muhammad saw is Allah’s Messenger. He is the last of all messengers and prophets. There is no more after him. I follow the sunnah of Prophet Muhammad saw. Do you know that the disbelievers Quraysh believe in Allah too? But they refuse to say the shahadah? Because even though they believe in Allah they also believe in idols and mystics. They know that if they say the shahadah and declare that Allah is the only god worth to be worshipped and that Mohammad saw is the Messenger of Allah, they would have to forsake all rituals and traditions. Do you know that one who just turned a Muslim and declares the shahadah and later died in that state shall enter jannah, bi iznillah? May we be among those who truly understand. May Allah guide us to the straight path. that the Messenger of Allah (may peace be upon him) recited in the two (supererogatory) rak’ahs of the dawn (prayer):” Say: O unbelievers,” (Qur’an, cix.) and” Say: Allah is one” (cxii.). 3. According to Imam Ahmad, Ibn Umar saw Prophet Muhammad also reciting suratul kafirun and suratul Ikhlas in the two rakaahs voluntary prayer after maghrib. According to Imam Ahmad (referring to Tafsir Ibn Kathir), Ibn Umar said, “I watched the Prophet s.a.w. twenty four to twenty five times recitiing in the two rakaahs before the morning prayer and the two rakaahs after the sunset prayer on approximately ten or twenty different occasions “say Al Kafirun” and “He is Allah one”..
3. The sunnah prayer after maghrib prayer. The Quraysh despite being the majority relative to the Muslims in Makkah during the time of Prophet Muhammad s.a.w. was threatened with the growing of Prophet Muhammad’s teaching. They can see that the Muslims is growing and Muhammad s.a.w. continue to defame their idols. In a strategy to minimise the spread of Islam, they invited Muhammad saw to worship their idol for a year and in return they would also worship Muhammad’s God for a year. Thus Allah revealed this surah and commanded His Messenger saw to disassociate himself from their religion completely. and He is Allah Alone. Who has no partner. I do not worship according to your worship, which means that I do not go along with it or follow it. I only worship Allah in the manner in which He loves and is pleased with. Yo do not follow the commands of Allah and His legislation in His worship. rather you have invented something out of the promptings of your own soul. The lessons for the children here are mainly to hold strongly to the Deen. To not be easily swayed by others and sacrifice their religion. Even for a little while. Even under pretentious. More so to please others. Or are afraid the lost of job and position and glamour and friends. Be strong in your believe, your iman, my dear children from now on. The real world has many challenges. Hold on strong to your religion for one day we will all go back to face Allah. Think about this and reflect that all in this world are really temporary. To be your religion, and to me my religion. This last statement does not mean it is a license for idoltary. Rather it is like a warning of them chosing their religion for they will face the consequences later. A lesson for all of us to be aware of colluding with disbelievers to the point of leaving the Deen. I learnt a lesson dooing this lesson with the kids. i prepared a worksheet for the children on this surah. There 11 pages altogether. I was to excited and determine to finish up to get their feedback on the workable of the worksheet. But it was tiring, at least for S.
Next time I will break up the worksheet in intervals so they will always be fresh insya Allah. May Allah make it easy for all of us.